Its head looks like a turkey's, its body resembles a chicken's  now scientists can explain why one of the poultry world's most curious specimens has developed such a distinctive look. 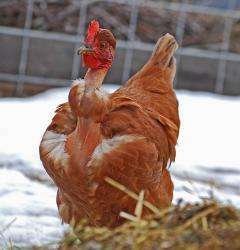 The Transylvanian naked neck chicken  once dubbed a Churkey or a Turken because of its hybrid appearance  has developed its defining feature because of a complex genetic mutation. This causes a protein  BMP12  to be produced, suppressing feather growth and causing the bird to have an outstanding bald neck. The discovery also has implications for understanding how birds  including vultures  evolved to have featherless necks due to their metabolism of vitamin A selectively in neck skin. The research, published in the journal PLoS Biology, was funded by the Biotechnology and Biological Sciences Research Council. Dr Denis Headon, who led the research at The Roslin Institute, said: "Not only does this help our understanding of developmental biology and give insight into how different breeds have evolved but it could have practical implications for helping poultry production in hot countries including those in the developing world." Intriguing how life evolves to accommodate a need. This chicken obviously evolved to make it easier for humans to decapitate it, the conventional method of harvesting the bird for food. This chicken did not exist before the invention of the axe.